The Military Folded Flag Display Case is from the company that was honored to be selected to provide the flag case for President Ronald Reagan's burial flag. The Military Folded Flag Display Case is from the company that was honored to be selected to provide the flag case for President Ronald Reagan's burial flag. 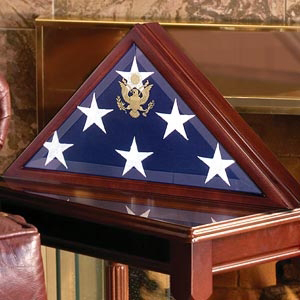 The Military Folded Flag Display Case have also been chosen by the United States to supply flag cases for the families of our fallen heroes serving in the armed forces. This Folded Flag Display Case is made out of solid Cherry, hand crafted flag case is sure to become a treasured keepsake for generations to come. The Folded Flag Display Case is hand rubbed Cherry finish, beveled glass front, and great seal of the United States completes the look of this case which creates a proper memorial for your loved one's tribute of their military service.